Barnacle plots at Point Sierra Nevada consist almost exclusively of Chthamalus dalli/fissus, although Balanus glandula are recorded on rare occasion (note that species were not distinguished until 2001). Cover of Chthamalus spp. varied inversely with rock cover nearly perfectly, with little else occurring in these plots. Littorines were consistently common in the barnacle plots and limpets were also present in moderate numbers. Mytilus cover in mussel plots remained high and extremely stable at Point Sierra Nevada, hovering just above 80% for nearly the entire 20 year monitoring period. Rock and the goose neck barnacle, Pollicipes generally made up the remainder of cover within the plots. Limpets were the most common motile invertebrate within the mussel plots, and exhibited a seasonal fluctuation in abundance, with higher numbers in fall than in spring. Other motile inverts consistently found within the mussel plots included three types of snails (littorines, Tegula, and Nucella), a chiton (Nuttallina), and the lined shore crab (Pachygrapsus). Hesperophycus cover within its target plots started out high (around 90%) and then declined precipitously to around 15%, where it hovered for several years before recovering slightly and stabilizing at around 30%. Beginning in 2010, Hesperophycus cover gradually increased to roughly 75%. However, it has recently declined again and in fall 2014, much of the Hesperophycus appeared to be sunburned or heat-stressed and in many cases only the stipes remained. Declines of this rockweed corresponded with increases in cover of bare rock and Endocladia. Littorines were variable in abundance, but generally quite common in the Hesperophycus plots. Limpets were less abundant, but still common in these rockweed plots, and the black turban snail, Tegula, was consistently present in low numbers. Another species of rockweed, Silvetia, has also declined over time in plots where it is targeted at Point Sierra Nevada. Initial mean cover was >90%, then steadily declined and stabilized at around 50%, although recent years have seen small increases in cover. In some plots, Mytilus, Hesperophycus, Endocladia, or Mastocarpus has moved in, but a fair amount of bare space (rock) remains. Littorines and limpets were generally common, but variable in abundance over time within Silvetia plots. The black turban snail, Tegula, was also consistently common. In Mastocarpus plots, cover of the red alga is highly seasonal, with higher cover in fall than in spring. The seasonal pattern of Mastocarpus varies inversely with cover of the red turf alga, Endocladia, also present in the plots. 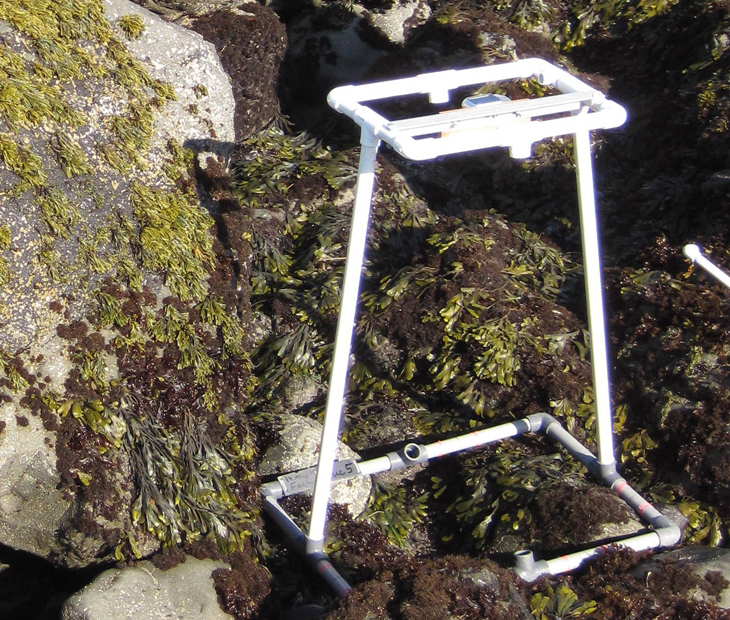 The way in which hydrodynamic forces affect intertidal plants may help to explain seasonal variation in size of Mastocarpus populations. When water velocities are low, such as during the summer months in central California, hydrodynamic forces do not limit thallus size (Carrington 1990). However, as water velocity increases, larger plants are torn out. 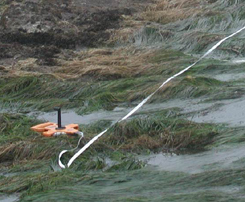 Small plants may be able to better withstand large hydrodynamic forces associated with winter swell. Indeed, our plots generally contain smaller plants (and hence lower cover) in the spring. Mean cover of Mazzaella was relatively constant over time within plots where it is targeted, although some seasonal variation was apparent (commonly higher in fall than spring). Reductions in Mazzaella cover were often associated with increases in cover of articulated corallines, suggesting that coralline algae persisted as a stable understory below Mazzaella, and reduced canopy cover of Mazzaella simply exposed more corallines. Dominant species in the broad group “other red algae” included Chondracanthus canaliculatus, and Gelidium spp. As with Mastocarpus, larger blades of Mazzaella tend to be ripped out during winter storms, leaving a perennial basal crust behind. In early spring, our plots tended to have mostly small plants that had just begun to grow back. Surfgrass (Phyllospadix) cover hovered at around 80% along the transects where this species is targeted. Mean cover exhibited slight seasonal variation, with lower cover in the spring following winter storms that ripped out plants and abraded leaves. Counts for the ochre star, Pisaster ochraceus, in the seastar plots at Point Sierra Nevada varied substantially over time, and showed a slight decreasing trend over time through 2013. 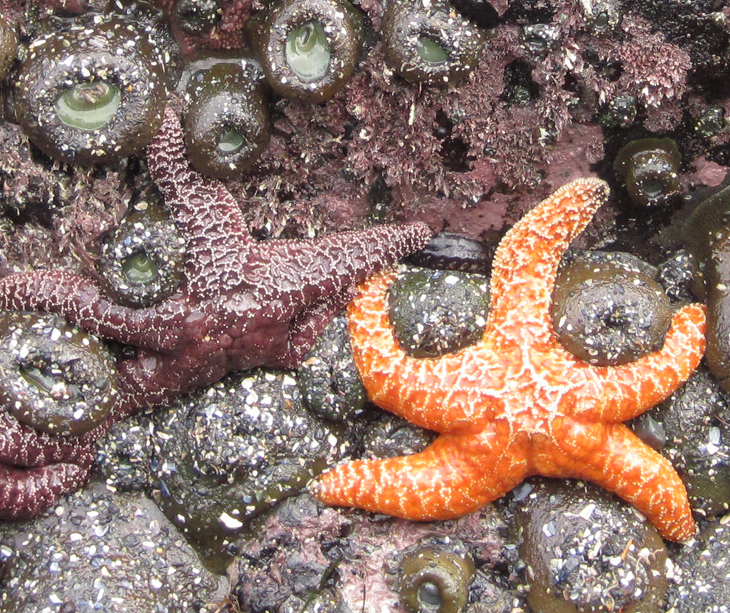 In 2014, sea star numbers plummeted due to wasting syndrome. Individuals were generally large, with only a few samples where significant numbers of small individuals were recorded, suggesting that recruitment to this site tends to be patchy, which could negatively influence recovery. The ochre star was the only species recorded in our plots at Point Sierra Nevada, but biodiversity surveys also documented the bat star, Patiria, the sunflower star, Pycnopodia, and the leather star, Dermasterias. Point Sierra Nevada is the southernmost site at which we find the katy chiton, Katharina tunicata, in our sea star plots, albeit at very low numbers.